It turns out their timing was perfect, according to Scott Security Systems President, Scott Granger. “We had been exploring ways to take our company to the next level in an extremely competitive and rapidly expanding industry. We had come to the conclusion a partner with the right capacity, access to emerging technologies and a strong national presence was required. That partner would have to be willing not only to invest in our vision, but also had to have the resources to fully support it,” Granger noted. Jones also adds that as Vancouver’s Lower Mainland and Fraser Valley neighbourhoods evolve, so do the methods and required approaches needed to keep the people and their valuables safe. Going forward, SecurTek and Scott Security Systems working together makes this goal more easily achievable. 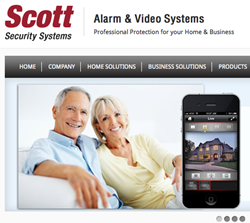 Scott Security Systems is a well-respected and trustworthy company which has provided electronic security systems, video surveillance systems and access control to the Vancouver and Lower Mainland marketplace since 1978. Their major focus has been delivering an extremely high level of service to its extensive customer base. They are also certified to install and service ULC approved alarm systems. SecurTek is a leading provider of monitoring solutions and event related information services with an extensive dealer network and strategic partnerships, servicing customers across Canada. A subsidiary of SaskTel Telecommunications, SecurTek was awarded the Five Diamond Certification for providing superior monitoring service in the North American security industry by the US-based Central Station Alarm Association (CSAA). SecurTek monitoring stations are Underwriters' Laboratories of Canada (ULC) certified. This means SecurTek meets or exceeds the highest industry standards regarding call overflow, staffing requirements, response procedures, computer systems and backup power systems. SecurTek offers burglary, commercial, fire, environmental, medical, video, home automation, access control and residential monitoring services.